The Tour de Walter, like the Tour de France, is now on its last leg, the Champs-Élysées of sorts. We hope you have enjoyed the 4 legs of the Series of Challenges, and will have more soon. We want to keep you posted on all things Sir Walter Running, so if you haven’t signed up for the Sir Walter Running email list, please do so here! What is it? 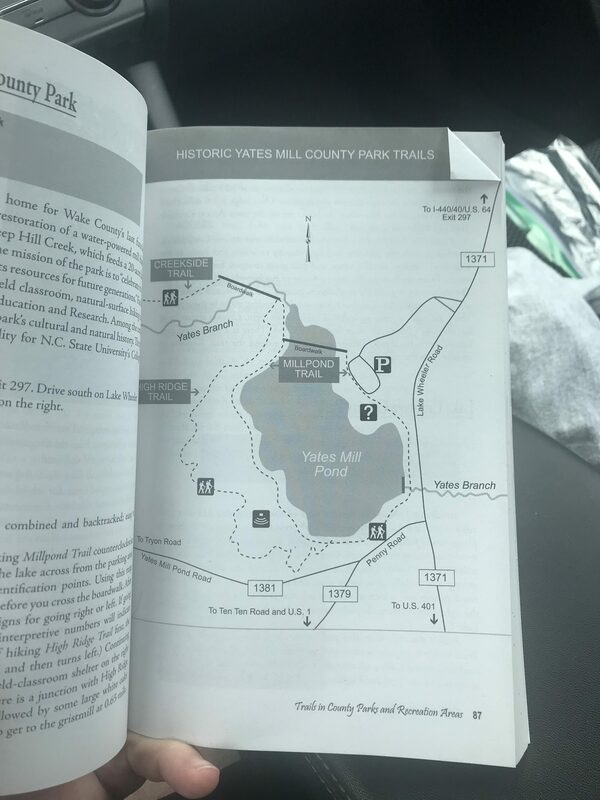 Historic Yates Mill County Park is the inspiration of the 2018 Sir Walter Miler logo. It’s also a fun place to run. With 3 trails that can be pieced together for a nice ~3 miler, we think you’re going to enjoy this last challenge! Make sure and take a photo by the mill when you’re done. And keep in mind, you may see some wildlife. Where do I park? In the parking lot! Historic Yates Mill County Park is located at 4620 Lake Wheeler Rd, Raleigh, NC 27603. You’ll want to walk towards the left after you park. Where do I start? Once you park, you’ll want to walk to the left, past the actual Yates Mill. You’ll walk down and up the rocks and over to a fence with a door. Start here. Walk past this. Look familiar? This is where you will start. Right in the “door frame.” You’ll also finish here. Where do I turn once I’ve started? Go about a half mile straight along the side of the lake (aka the MillPond Trail) before taking a hard left towards the Creekside Trail. The Creekside Trail is a big lollipop. And when you come back around and over a bridge, you’ll take a hard right onto the High Ridge Trail (see below photos). The High Ridge Trail dead ends back at the lake, where you will bear right and head for the finish! At the end of the bridge, take a HARD RIGHT onto the High Ridge Trail. If you take the wrong right, you’ll be alongside the lake. Don’t do that! At the end of the High Ridge Trail, take a right and head towards the finish. When can I run? Historic Yates Mill County Park is open 7 days per week, 8 a.m. to sunset. No Midnight runs! What do I win? Again, we will have a random drawing for 2 Shirts of your choosing next Tuesday for ANYONE that completes this Challenge before Monday, July 30 at Midnight. Tour de Walter? This is the 4th of a 4 segment Challenge called the Tour de Walter, in honor of the Tour de France. Everyone that competes all 4 segments will get a Tour de Walter tank top, and the Male and Female with the lowest overall times will get a pair of the Runologie x Sir Walter Miler goodr sunglasses that commemorate Sir Walter Miler 5! (now in stock at Runologie)! We will post Final Overall Standings on August 1, 2018! Thanks to all who completed the Umstead Steeplechase last week! The 2 random drawing winners are Christina Beauchamp and Scott Perry. Email us to claim your postrun polos! Same goes for Uncle Ebenezer Winners Spencer Husen and Kate Mueller!